If you live in Northwest Ohio, there’s a pretty good chance you know many of our satisfied customers. We have sealed an average of over 3,500 driveways each season for the past decade. Just ask your neighbors. Perrysburg Residential Sealcoating is the premiere choice for asphalt maintenance in the Toledo area. Our experienced crews prep and seal your driveway quickly and professionally, providing you with a neatly sealed driveway at a fair price using the highest quality products. icals, especially alkalis and winter salt. 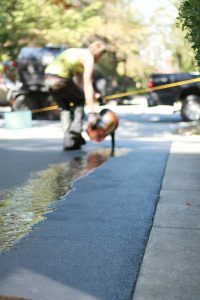 Sealing asphalt slows water damage caused by rain, snow, freezing and thawing. The smooth, even surface of sealed pavement makes sweeping, snow removal and maintenance easier. Proper sealcoating costs only pennies per square foot and saves dollars in future repairs. We schedule all our sealcoating based on your location, or Neighborhood Code. PRS has many days throughout each season when we will be sealing driveways in each Neighborhood Code. By scheduling this way, we can maximize crew efficiency and keep your prices low. Despite the increase in our materials costs once again this year, we have not increased our prices to you for this season. Always remember that sealcoating is a preventative maintenance, and is not intended to restore or repair a deteriorated driveway. The biggest misconception about sealcoating is that it will magically make your driveway a smooth surface, filling gaps and potholes. The truth is that while sealcoating does make surfaces a little smoother over time, and thus easier to sweep and shovel snow, it will not “level out” any asphalt and is not meant to do so. A coat of sealer is to your driveway as a water sealant is to your deck. The added bonus of sealcoating is the beautiful slate black look you get when it is finished. So if you have potholes, gaps, cracks wider than ¾”, dips, ruts or any other serious deteriorations in your driveway, let us know. Your driveway may just require a little extra TLC. Many times we can repair these by replacing a small portion of your driveway if you are not quite ready to replace the entire drive just yet.